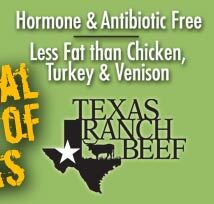 Texas Ranch Beef grass fed beef is healthier than chicken, turkey, & venison. is because of the incredible taste. 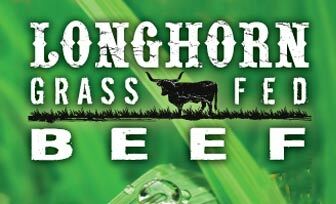 on the fertile grassy plains of our area of Texas ranches for quite a few years. They seem to love it here, as do we. Our 600 Longhorn cows have exceptional vigor, good frames, muscle structure, hardiness, and are naturally resistant to disease and travel exceptionally well—this makes them the best mama cows for raising calves on grass range conditions without grain-based supplemental feeds. Texas Longhorn cows crossed with Charolais bulls produce an extra lean meat with good muscle size showing no fat in the muscle. We also produce pure Longhorn calves for beef. Our cattle are high in Omega-3 and CLA and tenderness is good. All beef is raised from calves born on the ranch and we certify our meat to be 100% natural grass fed beef free of hormones and antibiotics. We have been in the cattle ranching business for over 40 years. The native grass pastures are managed through rotational grazing, holistic practices and seasonal use to enhance good grasses and forage for the cattle. Yearling cattle are grown out to 600–700 pounds on native prairie grass pastures, some of which are overseeded with rye grass in the winter. Cattle are raised in large pastures about 400-plus acres each. They are handled quietly by horseback and in a low stress manner to avoid sickness and the need for antibiotics and other medicines. Unstressed cattle on good native grass pastures means beef that is healthy, hormone and antibiotic free, and in prime condition for harvest. 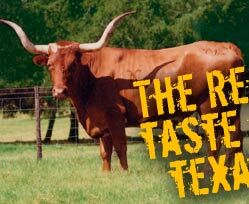 Texas Ranch Beef is processed and inspected in a USDA approved facility, vacuum packaged, fresh-frozen and supplied year-round. We offer a variety of cuts including steaks, ground meat, hamburger in 2-pound packages. We sell over the internet and have a ranch retail store on Main Street in Bellville, Texas.